V63 of the U R Basketball mod by skoadam and slimm44 is now available! 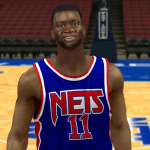 The latest version includes over 100 new faces for retro players, including Jerome Kersey, Sam Perkins, Jason Williams, Isaiah Rider, Darrell Griffith, Sean Elliott, Manute Bol, Muggsy Bogues, and many more. All you need to do to get your installation up to date is to re-download the Retro CF#6 part. You can find V63 of U R Basketball here in our Downloads section. Be sure to check out the release topic here for support, previews, and more information about future releases. The 1962 season roster is currently being worked on, with new artwork and shoes being among the enhancements.